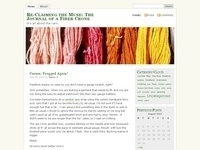 Pictures and description of fiber art projects. Hand spinning, weaving, tapestry, crochet &.. mixed media. Also hand dyeing of animal fibers using plant materials, food colors & acid dyes.